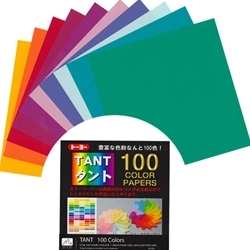 Tant Origami Paper → Tant Origami Paper 100 Color Pack 3"
Tant Paper is a thicker origami paper with color on both the front and reverse and a slight surface texture. It holds a crease well and responds to wet-folding. The 3" Tant Origami Pack includes 100 sheets of Tant Paper, each a different color. Bright hues jump off these Tant Origami Papers. Each sheet provides a stiff origami paper with a crepe-like texture. The Origami Tant Paper holds a crease well and responds to wet-folding making it a perfect paper for folding projects with sharp edges such as geometric shapes and modular origami. This Tant Origami Pack includes 100 sheets of Tant Paper, each a different color. You will enjoy these special papers.